Free Christmas Cake Recipe,Christmas Cheesecake Recipe,Easy Cake Recipes for X-Mas. For those of you who are looking out for an interesting yet easy cheesecake recipe for the upcoming Christmas festival, we have a great recipe. Try the Easy Mocha Rum Cheesecake Recipe and impress your guests this Christmas. · First of all, preheat the oven at 150 degree Celsius. · Take the cake tin and grease it lightly with oil or butter. · Mix biscuits along with mixed spice and butter in a mixing bowl and mix it well and place this mixture at the base of the baking tin. · Bake the mixture in oven for about 10 minutes and then cool it off. · Prepare the filling by melting chocolate in a bowl over a double boiler at sim heat, while stirring it continuously. · It’s time to combine corn flour with cream cheese, sugar, sour cream and eggs in a large bowl to make a smooth batter. · Now, pour this mixture over the prepared base and tap the tin sharply to set the air bubbles and bake it for about 45 minutes to 1 hour until the top of the cake is set. · When baked, remove it from the oven and cool it off in a refrigerator for about 5 hours. · Prepare the decoration by cutting the cake into half using a sharp knife. 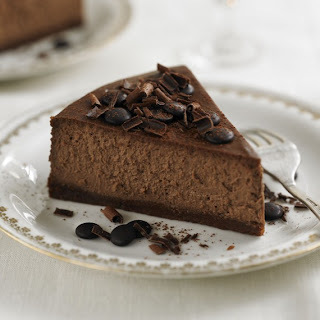 · Now, sprinkle the grated chocolate along with coated coffee beans and dust the cocoa powder. · Your delicious Mocha Rum Cheesecake is now ready to be served.